Reverb has this listed as non functioning for $700. I am not calling them out but is this mic worth this much money? Essentially in my mind its a parts mic.. I think Schoeps only does best effort on the 3 pattern capsules now so the capsule may be done. 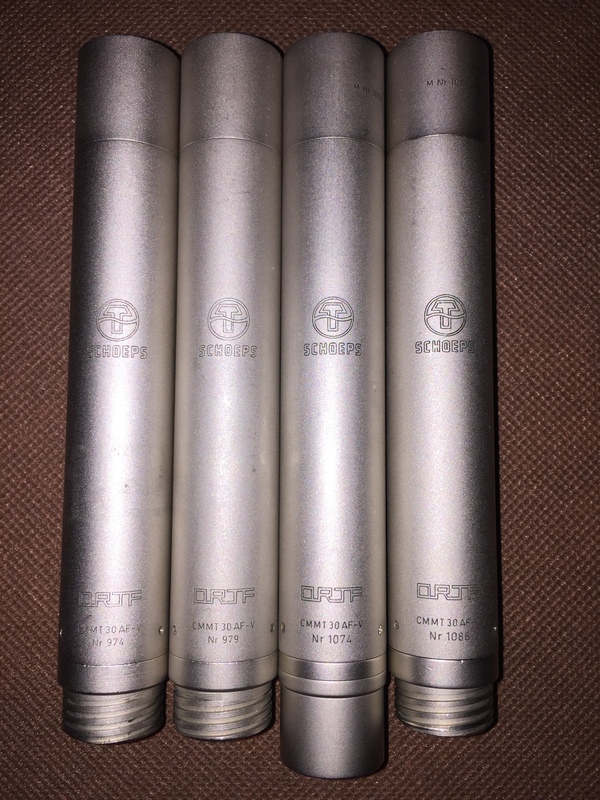 I would think the value on this mic in this condition is not too much (Tpower makes the body not have a lot of value - 3 pattern vintage capsules don't have the same value as a modern mk6 due to the low chance of repair and age) - maybe $300-350 - I would think in working condition maybe $500 max. From my tracking of the mk26 capsules (the vintage version of the mk6) sell used for $250-300 (working or semi functional in Fig8). If you can PM me some good resources on where to look for CMT bodies and caps it would be appreciated. Try to push for a 120v nbox. The "55" part of the designation doesn't seem to belong; that would indicate a 48-Volt phantom-powered two-pattern microphone with an output transformer, while this is a 12-Volt parallel-powered three-pattern microphone with no output transformer. I suspect that the microphone is actually stuck in the figure-8 setting, even though the seller thinks that it's omni because it has equal response in both front and back (he should try the sides as well). When the gaskets in this type of capsule dry up, harden and fail to seal off the backplate, the result is a capsule that's figure-8 regardless of the setting. larrysellers, I'm not sure what kind of project you have in mind, but these were 60-Volt capsules, not 120, and their physical fittings are unlike those of Colette capsules, so I don't think you will find any kind of active cable that can work with them. Edited later to add: Schoeps' supply of replacement parts for three-pattern capsules is very limited now, all the more so for older models such as the CMT series (or even the early Colette series). Repair attempts are such a gamble at this point that the company no longer recommends that they even be attempted, unless the capsule is already in an essentially useless state and the customer feels that nothing would be lost in the event of a total failure. ... and to address the emphasis of the thread on pricing: The CMT 30/40/50 series ended in the 1970s (except for the CMTS 501 stereo microphone, which was produced into the early 1980s), and back then Schoeps wasn't as widely known then outside of western Europe as it is today (it took me months to find out where I could buy them), and they were strictly a high-end professional product--the "prosumer" market didn't really exist for most of that time. Thus Schoeps' production quantities were smaller during those years than they are now. As a result there are far, far fewer CMT 30/40/50-series microphones on the used market than CMC-series microphones. The ones that have XLR connectors and are fully functional--especially the CMT 50 series which used standard 48-Volt phantom powering--can fetch prices in the same range as today's models, whether that is entirely rational or not. There is truly no sonic or technical reason to prefer any CMT-series microphone over its CMC-series counterpart, except that the CMT 50 series drew lower current (< 1 mA) than today's P48 models (~4.5 mA), and of course the CMTS stereo microphones were unique to the CMT series. But the three-pattern capsules are a special case. Due to their lack of further maintainability, good ones even from the CMC series rarely come to market at all any more, and the prices are a bit of a wild card, as are the accuracy of the descriptions that you'll find on sites such as eBay. The update to the gasket material occurred 10 to 15 years after all production of CMT-series capsules had already ended. As a result, the only "MKT 6" capsules that are fully functional in all three patterns, and can be expected to remain that way for a decent number of years, are those which happened to go back to the factory for maintenance during a rather specific "time window". So that's a minority (maintained during that time) of a minority (three-pattern) of a small minority (CMT series). To note the French broadcast market version of the CMT 30 (the CMT 30 F) uses different capsules that are 120v and screw to the bodies. These are not the same as the Collette series and the capsules have male threads at a different (smaller) diameter then the Collette series (and also only a center contact pad). Note that originally most if not all CMT 30 F's ran -12v Phantom and used Sogie connectors (not locking DIN or XLR). These French market capsules capsules work with the m221, m221a, m221f, cmt30f, cmmt30f and cmmt30af microphone bodies. They do not connect directly with the m221b bodies. To note the m934 series was the most widely produced with probably around 7000 made, then the mk26 with around 2500, next mk241 with around 1750, and the rest - I would think no more than 11-15k total capsules were made for the m221 series (including the b) and the susequent cmt/cmmt french market bodies. These numbers are based on ones I have seen in the wild and on Schoeps French Market manifests from the early to mid 1970's.